Was it only the light wind CB that stuck up above the deck? I don't know what board you should buy or sell, but I am also in the camp that the importance of foot straps cannot be overstated. I'm very tall with very big feet, and often find the front strap too far back. Strap position is one of the things I specifically look at when buying a board, and I have sold some boards that were great when lit up, but too difficult to get back in the straps comfortably in a wide range of conditions. If you were to try all the longboards from the Equipe era, I'd bet that if one board stood out with regard to strap positions that worked for you, then you would find the performance of that board superior to the others. It literally will change your perspective. Even just getting in the front strap alone is huge. I know this isn't the feedback you were looking for, but I just thought I would throw out there how important strap position is for me when choosing keepers. For me, if the strap positions don't work, then every other performance aspect of the board is much less important. So, in my humble opinion, a board that you are not able to ever get into the straps, is a board that simply will not work as well for you as a board that you can get in the straps. Correspondingly, IMHO, I feel that if you ignore strap position when purchasing a board, then you are selling yourself short. Also, a trick that I use quite often is not using the center hole of the strap itself. This allows me to position the front strap a bit more forward and inboard. Sounds trivial, but it can make a difference. I find the strap positions on my Kona Step One quite friendly. I can get in the front strap in that "half speed sort of planing sort of gliding mode" quite easily. If you enjoy the Equipe, don't sell the board looking for a "better" longboard. I don't think you will find one. The RSD2 will be different and perhaps more technical to sail, and if that is what you are looking for, then go for it. I still would not sell the Equipe. I currently have 2 longboards and a windsup and each have their own characteristics for light wind sailing. My lightwind boards are a CarbOne, Phantom 320, and a windsup. I think folks put WAY too much emphasis on the use of footsteps on longboards. Its much more important to have your feet in the right position. If you get your feet in the right position, and there happens to be a footstrap there, go ahead and use it. Otherwise, use your harness lines to load your feet hard enough to keep them firmly planted on the board. So, for example, if you have enough wind to get on a deep planing reach, you shouldn't be trying to get both feet in the straps. the back foot should be near the center line. If you are in marginal no-centerboard planing conditions, there is no way your back foot should be anywhere near the back footstrap. Etc., etc. Just went out on a Mistral Equipe LCS-XR (ME1) and Ezzy Infinity 7.2 circa 2005 on Lake Michigan. The winds were 13 knots gusting to 22. These performance longboards are so rangy and versatile. Even though I only sail less than a dozen times a year, I felt fully in control, perfectly powered, unaffected by chop, and effortless. 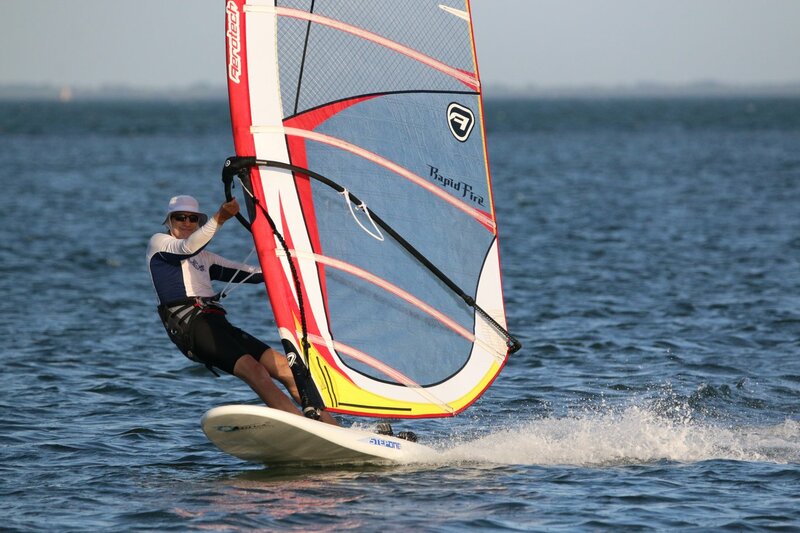 They are probably not as fast as short boards but still fast enough and so easy to sail. If I were on my free formula board I would be getting launched on chop and sailing out of control. Sure, an expert sailor would be fine on a FF board but not a rusty intermediate like me. A few years ago I picked up a Superlight II on Craigslist, which, I believe, has the same shape as ME2 but in slightly heavier construction. I thought it would be better for me since I weigh about 200 pounds. I would say I prefer my ME1 since it is lighter and it has a thinner tail which helps with control. If I were racing it would be different. The Superlight also comes with a big carbon centerboard that hurts my feet and so difficult to push through the gasket. I will probably sell it since the ME1 and the 7.2 has become my exclusive combo (except for some Windsup wave sailing I do as well). I agree that footstraps are not as critical for longboards as they are for short boards. Some people complain that long board footstraps are too far back and are difficult to get into but I think it is what helps make them so rangy. i think you get that extra leverage from being further back that you do not get on a short board. 2. gives one better control in planing, choppy cornering. the ones I did see - were scams = NICE !! Was my '98 Fanatic Class X 250L raceboard ever meant to plane? I consistently use with with my Speed Freak 8.5. Board came stock with a 37cm fin that has no lift. Since then I bought a couple of bigger fins upper 40-something and even a 50 something cm ones to get more lift and yet have to try them. The boards glides excellent otherwise in marginal conditions. But at 35lbs heavy and me at 190 lbs at it may be a lot of effort to make it plane. According to the old rule of thumb for matching fin size to board size: Measure the tail width of your board, 30 cm forward of the tail. That width, +/- 5 cm, is the typical range of fin sizes that will work well with your board. This rule gets me about a 37cm fin because the board's tail is narrow tapers. Also foot straps are useless on this board due to variable wind conditions and also because they were shot. I removed them altogether and sail with a pair Atan boots and have excellent grip just about in every wind. this might also be the mega cat? race boards originally were designed to plane. depends on which sail you may be trying to use in these various wind conditions. i have used boards similar to this with 9 meter sails in the late 80's. the sails had virtually no twist, and were super powerful. despite long boards extending the upward wind ranges of larger sails back then, we were ever ready to rig smaller all too soon. never used much more than 40 cm fins back then.